Did you vote for the AOL Running Man yet? 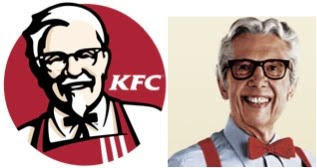 If you happen to check out the site, take a minute to note how eerily similar Colonel Sanders and Orville Redenbacher look. Do we know if there's a backstory here? Like, perhaps they're cousins in real life but had a falling out when Orville declared he was forgoing the family fried chicken business to instead promote gourmet popping corn. Was Colonel Sanders really a colonel? And why is colonel it spelled that way instead of kernel? Oh, I bet I know... because that just brings it back around to corn. I feel obligated to point these similarities out to you, readers, so you won't be caught unawares and wig out if you ever see their two photos side-by-side. Just saying. It's weird. (I feel like this observation might lead some of you to think I've really lost it this time. Don't be alarmed. I am just sleepy & wacky.) That is all.